https://justarrived.by/wp-content/uploads/2019/01/notaio-giannelli-torino-003.jpg 175 275 content_manager https://justarrived.by/wp-content/uploads/2019/01/logo_top-1.png content_manager2019-01-16 16:44:39 itemprop="dateModified" itemtype="https://schema.org/dateModified" Private Notary Volkovec E.S. https://justarrived.by/wp-content/uploads/2019/01/notaio-giannelli-torino-003.jpg 175 275 content_manager https://justarrived.by/wp-content/uploads/2019/01/logo_top-1.png content_manager2019-01-16 17:01:05 itemprop="dateModified" itemtype="https://schema.org/dateModified" Private notary Pilat E.I. https://justarrived.by/wp-content/uploads/2019/01/notaio-giannelli-torino-003.jpg 175 275 content_manager https://justarrived.by/wp-content/uploads/2019/01/logo_top-1.png content_manager2019-01-16 16:55:25 itemprop="dateModified" itemtype="https://schema.org/dateModified" Private Notary Novik T.A. https://justarrived.by/wp-content/uploads/2019/01/notaio-giannelli-torino-003.jpg 175 275 content_manager https://justarrived.by/wp-content/uploads/2019/01/logo_top-1.png content_manager2019-01-16 16:49:21 itemprop="dateModified" itemtype="https://schema.org/dateModified" Private Notary Koroleva I.I. https://justarrived.by/wp-content/uploads/2019/01/notaio-giannelli-torino-003.jpg 175 275 content_manager https://justarrived.by/wp-content/uploads/2019/01/logo_top-1.png content_manager2019-01-16 17:05:36 itemprop="dateModified" itemtype="https://schema.org/dateModified" Private notary Filimonihina S.A. If you need to legally verify a copy of a document, draw up a marriage contract or ensure property acquisition you are most likely to turn to a notary. Notary services in Belarus are of demand with the growing number of marriage and divorce documents management as well as mediator services. Notary services in Minsk have the largest demand both with private and legal entities. Governmentally run notary bureaus are situated in every district with working hours and the list of services provided enumerated on the official websites. Although these types of notary assistance are available, people in Belarus tend to make use of a private notary in Minsk. The latter is considered to be more reliable and trustworthy, as they deal with complicated issues and are more involved in the positive outcome and final settlement of a question. 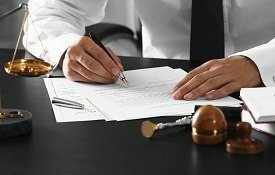 Notaries in Minsk deal with inheritance agreements between the parties, draw up and validate the necessary documents. They also are legible to draw up the plans for future agreements and legal formations, inform the clients on notary procedures that are to be fulfilled in such cases. On this page, you can see the list of the most high-ranking notaries in Minsk, whom you can turn to and be sure that you receive the help you are in need of. These specialists proved themselves to be reliable and responsible and are the members of both local and international notary communities. In Belarus, the days when notary services can be received free of charge are appointed every month. Legal clinics cater to social and private issues that arise on various occasions. Professional consultation, legal advice, and psychiatry mediating are what Minsk notary bureaus offer.